Total Power Required 13 H.P. With sincerity and hard work of our professionals, we have carved a niche for ourselves in this domain by offering Heavy Duty Fly Ash Bricks Machine. Widely used for making fly-ash bricks, offered machines are manufactured using optimum quality raw material and advanced technology. 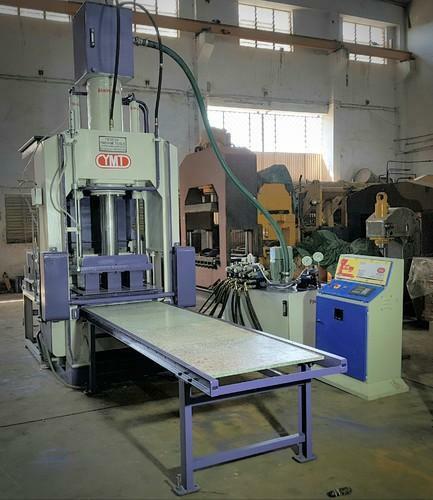 In addition to this, our offered machines undergo various tests under the supervision of quality controllers, in order to ensure their flawlessness. Automatic Vibro with High-Pressure Machine for Making Fly-Ash Bricks. Established in the year 2007, we “Yogesh Machine Tools”, are noteworthy Manufacturer and Exporter of high-performance range of Fly-Ash Bricks Making Machine, Paver Block Making Machine, etc. The offered products are precisely designed and manufactured using high-grade component and innovative technology as per the set industry standards. The components that we use to manufacture these products are procured from reliable vendors of the market. Acknowledged for their excellent efficiency, low maintenance, high performance and longer service life, the offered products are extensively demanded in various industries. In addition to this, clients avail the offered products from us in various technical specifications at industry leading prices.